I know what it’s like to gain 70 lbs during pregnancy (twice), and only see women in photos who are super fit, which makes you feel ashamed of your changing body. I know what it’s like when you have so many people pulling you in so many directions that you end up feeling worn out at the end of the day, and even though it’s not something we ever want to admit out loud… resentment can begin to creep in. I know what it’s like to look in the mirror and speak awful, hurtful, and unkind words to the woman staring back at you… the self-loathing I’ve felt in times of my life was completely paralyzing. I know what it’s like to drive your kids from soccer practice, to gymnastics, back to soccer practice, to piano — all with unwashed/dry-shampooed hair and having stayed up the night before with a teething, fussy baby. I know what it’s like to feel like you never really ‘quite’ fit in with your other mom friends and to feel like you are always letting people down in some way or another. I know what it’s like to go through a divorce or a breakup… and come out of it wondering if you have much worth or value to offer anyone. I know what it feels like to be in these situations, because I’ve been in every. Single. One. I also know what it looks like on the other side. I know what it feels like to finally learn that there are variations of normal, and that the amount of weight you gained during pregnancy (or during other times in your life) does NOT determine your worth. I know what it feels like to be at peace with your changing body, and to learn to accept the parts you cannot change and love your best features. I know how empowering it feels when it finally clicks that perfection is a myth and when you learn to show yourself grace during your imperfections — that this can become your biggest strength. I know the freedom of understanding that there are no “good foods” or “bad foods”, but just that there are some foods we should eat more of, and some foods we should eat less of. I know that when we show ourselves more love and grace, we are able to give grace more wholeheartedly to those around us when they need it most. …not just what is left of you. I always joke that I accidentally fell into the fitness industry. I was a history major in college! I didn’t even know a fitness industry existed… lol! Through a long series of events (that entire story, if you want all the details, I shared here) I ended up starting a blog, sharing loads of healthy recipes, at-home workouts, and then eventually getting certified as an ISSA personal trainer. I began writing ebooks (training programs and cookbooks), and started a membership section on my website. I continued to write, a lot. I shared the ups and downs of motherhood, and my own struggles with body image and self worth as my identity as a woman changed. 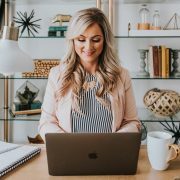 I learned that the more I wrote about the real, raw topics — things like…the stretched skin on my stomach after having two ten pound babies, the pain I experience after losing a baby through an ectopic pregnancy, and the frustration I felt taking care of two small children — the more people connected with what I was sharing, and more importantly, I learned that I was not alone. Suddenly, I had a tribe of women who were just like me. I wasn’t alone. And inside that community came strength, solidarity, and a belief that we could do these hard things. A village of women who had been in my shoes before and could help guide me through my struggles, and others who are walking right now through the challenges I’ve faced in the past. We became a community of women supporting women. Real women, sharing our real experiences. So, I made it a mission of mine to start talking about things that nobody talks about. Last year I wrote a book about peeing my pants! (LOL!) But that ebook was valuable because it also shows how this can be prevented if this is something you’ve struggled with after having a baby…or babies! 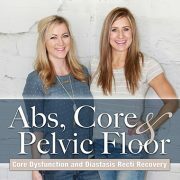 Abs, Core & Pelvic Floor was my best-selling ebook to date! We helped 55,000 women go through this program and have received the most uplifting feedback and testimonials! 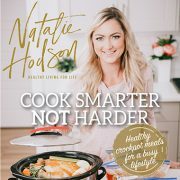 This year I wrote a crockpot cookbook called “Cook Smarter, Not Harder”. It shows busy people like us how you can make healthy meals on a budget in a fraction of the time! 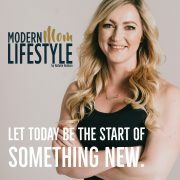 I recently started a program called Modern Mom Lifestyle with people just like us in mind. 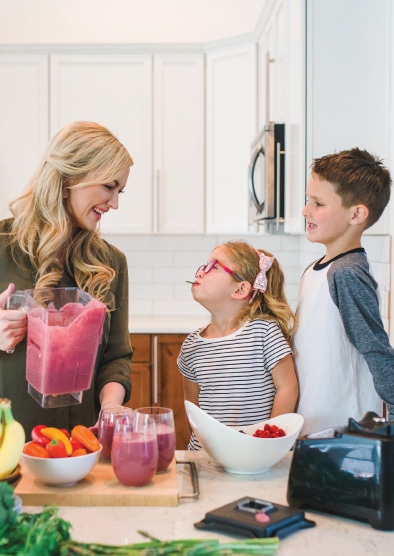 I wanted a flagstone product where if someone like my mom or my sister came to me and said, “I want to lose weight, what do I do?” I would give them this exact program. It includes weekly meal recommendations, fun monthly workouts and challenges, recipe database, grocery lists, motivation sections, FB group, and more. I’m excited for new programs I have coming out on the horizon: programs to follow during pregnancy, programs to help get out of debt, programs to help survive a divorce… and so much more. These programs can help women achieve a healthy lifestyle. I think healthy looks different to every single person. But, I do believe that physical health, emotional health, and financial health can be achieved for every single person who joins our community. I know… because I’ve been there. I believe in you. Let me show you how it is possible.